In the first five books of the Bible, sometimes called the Torah or Pentateuch, God gives instructions to Moses. The people refer to this as the law. These rules, or guidelines, are numerous. In fact, there are 613. Though I once considered counting them myself, I decided not to. Plenty of Jewish scholars already have, and they come up with 613. I’m fine with that. Bible students divide these 613 instructions into two categories: things we should do and things we shouldn’t do. Some people call these positive commands and negative commands. In case you’re wondering, yes, there are more things we shouldn’t do than things we should do. Furthermore, some Bible academics group these 613 commands by topic, such as worshiping God, making vows, offering sacrifices, and so forth. Even with these divisions and categorizations, the number of instructions is still unwieldy. Besides there’s not too many people I know—okay there’s no one I know—who follows all 613 rules. Again, scholars divide this list. The first four commandments relate to our relationship with God, and the last six relate to our relationship with others. Also, if you’re keeping track, the majority of the Ten Commandments tell us what not to do, only a few tell us what we should do. Someone asks Jesus to identify the greatest commandment. But he doesn’t give one answer. He gives two. The first is to love God fully and completely. The second is similar, to love others as much as we love ourselves. Then Jesus adds that the Law and writings of the prophets all hinge on these two commandments (Matthew 22:36–40). In the first letter Paul writes to the church in Corinth, he devotes a whole section to love. He tells them how important love is and gives them a description of how love behaves. Then he says that love never ends, even though prophecies—and other things people think are important—will cease. 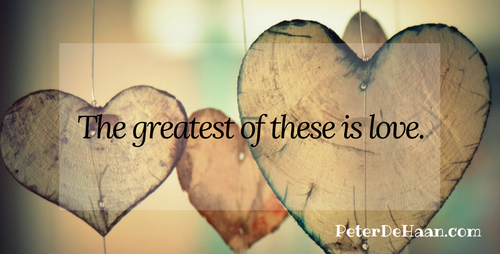 He concludes this famous passage with a succinct phrase, “The greatest of these is love” (1 Corinthians 13). So, we start with 613 instructions, focus on the ten big ones, and then Jesus narrows it down to two, which have a common theme of love. Paul confirms that love trumps everything. Instead of focusing on what we should and shouldn’t do—following a list of requirements with religious fervor—we should instead turn our attention to the greatest commandment: love. Love God, and love others. If we do this everything else should fall into place.